Callisto was the favourite of Diana, virgin goddess of the hunt. Her beauty aroused the attention of Jupiter, king of the gods, who seduced her by disguising himself as Diana. Nine months later Callisto's pregnancy was discovered when she was forced by her suspicious companions to strip and bathe after hunting. 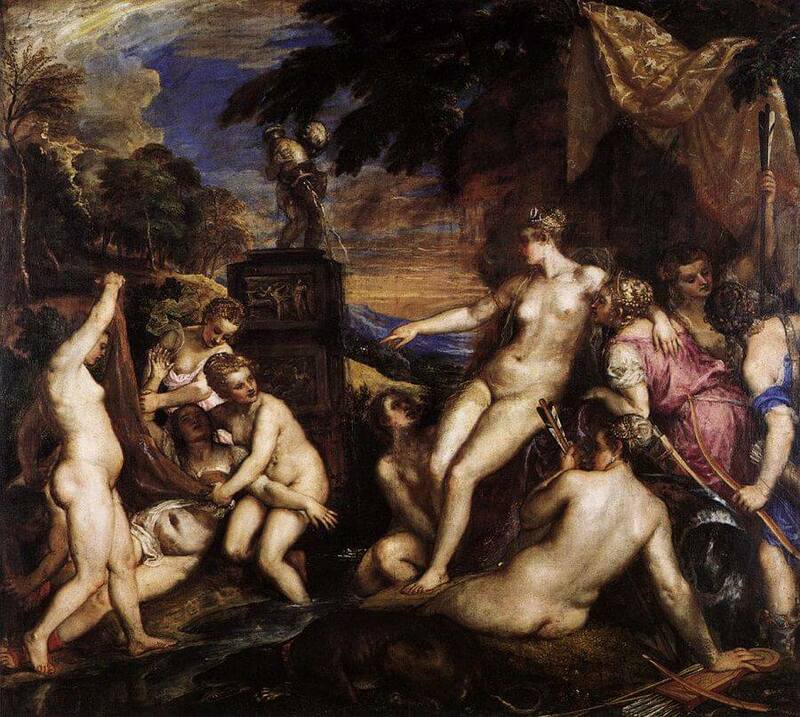 Titian chose to paint the moment of her humiliating exposure and banishment from Diana's chaste entourage. Diana and Callisto and Diana and Actaeon were painted for King Philip II of Spain between 1556 and 1559 and belong to a group of large-scale mythologies inspired by the Roman poet Ovid's 'Metamorphoses' - Titian himself referred to them as 'poesie', the visual equivalent of poetry. At the same time, Titian began another painting associated with this pair, the Death of Actaeon, also in the National Gallery. For some reason, Titian never sent this painting to the king and it remained in his studio unfinished at his death.